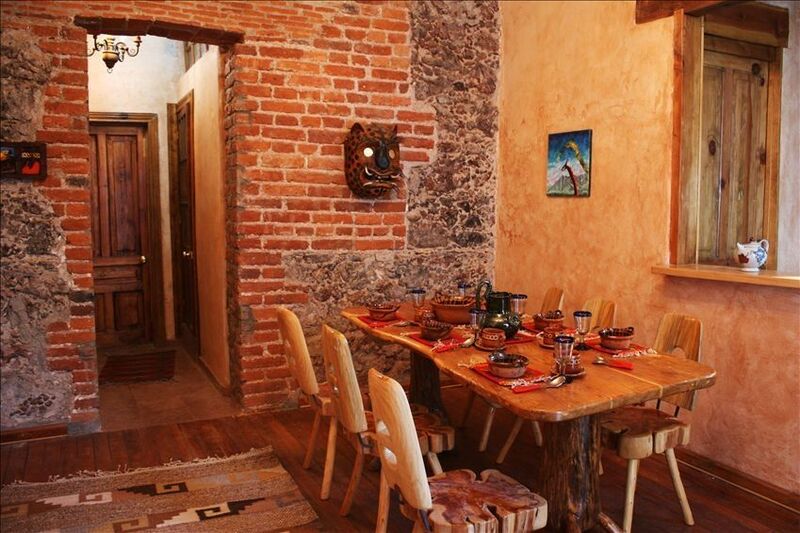 This beautiful apartment is in a 16th century former Monastery run by the Dominicans built right over the Palace of Cuauhtemoc, right in the core of the Centro Historico. It's a peaceful enclave (where you can't hear any traffic) just 50 yards from Plaza Santa Domingo and less than five minutes walk from the Zocalo - the main central square. The apartment has been beautifully restored with original stripped wood floors and colour washed plaster walls and is on the second floor of the building which is arranged around a courtyard. Most of the residents of the 34 apartments are Mexican families so you will get a real flavour of life in Mexico City. The second floor is reached by a flight of wide stairs. Two of the bedrooms have views across the Leandro Valle to the bell tower of Santo Domingo Church. One of the bedrooms looks onto a smaller internal courtyard. Kitchen/dining room - large fridge/freezer, cooker, double sink tiled with hand-made tiles and coffee maker. Hand-made table and chairs to seat six. Sitting room/lounge - sofa, hand made desk, chairs, television & DVD player (with large selection of English-language movies) and internet access. Bedroom 1 - Queen-sized double bed. Bedroom 2 - Double bed. Bedroom 3 - Twin beds (ideal for children or beds can be pushed together to make a king-sized double. Bathroom 2 - Wet room with shower, toilet, hand made ceramic wash-basin, limestone floors and walls. Sarah Tisdall and Arturo Reyes. We are both artists. Arturo has a degree from San Carlos in Mexico City and Sarah has a degree from The Slade School, University College London UK. We moved here 6 years ago from London. We enjoy the vivacity of the City and the beautiful old buildings in this area and the creativity shown by the Mexican Craftsmen in various disciplines. The climate is near perfect and it is easy to travel round the country from here. We like this ancient block of apartments and purchased one in addition to ours. We enjoy the vivacity of the City and the beautiful old buildings in this area and the creativity shown by the Mexican craftsmen in various disciplines. The climate is near perfect and it is easy to travel round the country from here. Beautiful area which is being refurbished. Three blocks from the Zocalo, many beautiful buildings round about, an outlook towards Santo Domingo Church. Easy walking distance to many historic sites such as Templo Mayor, The Cathedral, San Ildefonso Museum, Museo Nacional de Arte, Palacio de Bellas Artes. Three metro stations within easy walking: Zocalo, Allende y Lagunilla. Taxis easily available very reasonably priced. Sunday cycling with free bike rentals on cleared streets in the Historical Centre. Plaza Santo Doming Cafe and good Mexican food at Hosteria Santo Domingo. The location is popular with film makers, most notably Denzil Washington in Man of Fire, Dennis Quaid and Forest Whitaker in Vantage Point and From the creators of "The Matrix" and "Babylon 5" comes this tense series called "Sense8" in which eight people can telepathically experience each other's lives. Starring: Tuppence Middleton, Brian J. Smith, Doona Bae. TV also like to use it for soaps and adds. Frequently other entertainers use the Plaza, for example music and dancers, and equestrian events from time to time. Complementary drinking water, tea, salt, pepper, sugar, milk and coffee. Balcony overlooking 16th century Church of Santo Domingo and part of the Santo Domingo piazza. Arturo has been a gracious host, filled the fridge with our first breakfast, arranged transportation and answered all my questions in a timeline manner. But his apartment was not for us. It is charming and historic but we had issue with the hot water, alternating between scalding or cold. And the place could use a thought cleaning, under and behind furniture, and the oven (there was a plastic glass in the bathroom with traces of toothpaste from multiple guests before us). For the bedrooms that are street side, the windows dont close entirely so you'll here people walking and talking and the early brooming. We decided to leave early as it was a little too much for us. I can understand why people love this place, we would have loved it if we could have had consistent hot water and a clean dish scrub and the place cleaner in general. For our first 3 nights in Mexico City we stayed in this spacious, 3-bedroom apartment on the second floor of this impressive former 16th-century monastery. Arturo kindly arranged for his driver Alejandro to pick us up at the airport. The historic building is home to many regular Mexican families, who hang their laundry in the inner courtyard and tend pots of thriving plants. The huge space was more than enough for the two of us; I took a room overlooking the square, and my spouse took the inner bedroom. It was a luxury to have two bathrooms, one with a big step-in stone shower. The kitchen had coffee, water, and condiments, but since there are so many eating choices in Centro Historico, we never bothered to do any serious cooking. We loved checking out the ever-changing scene below in the square, as well as gazing up at the bell tower and church, very beautiful. Plaza Santo Domingo is a special corner of downtown, a great area from which to walk to many of the city's main sites, from Templo Mayor to Palacio de Bellas Artes. Most of all, Arturo took very good care of us and we felt very fortunate to meet him. (Next we moved to his apartment downstairs, and still can't decide which one we liked better!) This unusual, centuries-old rental in the heart of downtown provided a unique introduction to CDMX, one which we will always remember with great fondness. Gracias, Arturo. Arturo was so kind to us, and he sincerely did his best to help us when we needed it. However, there are some things that, if improved, could make a huge difference in someone's experience of the apartment and Mexico City. There was definitely something wrong with the water heater and its thermostat, and the gas tanks were not full. When handling raw meat you definitely need dependable hot water in the kitchen in order to cook safely and to thoroughly wash dishes and silverware free of grease. We had difficulty striking a balance between scalding and cold water for our showers, regrettably wasting a lot of water attempting to do so. We're a very well-travelled family, and even a 4-star hotel can have lousy beds. Considering the overall charm of this place, it's a shame not to invest in some mattress upgrades. It really is a basic element for a restful stay and, by our final night, my husband and I had some serious hip bruising, shoulder, rib, & back pain. These are all fixable things that can make even a loud boom box outside tolerable! All in all, there is no place on earth like Mexico City! It is so complex, historically charged, mournfully & ecstatically beautiful, bursting with life & ancient rhythms. This spot in the city center has so much to offer. I just hope that those improvements happen for future clients. Thanks, Arturo, for your kindness and hospitality. A perfect "pied-à-terre" just off the center of the Historic center. This amazing apartment was both quiet and convenient. It is close to many interesting museums and restaurants without being in the thick of the tourist madness. Good restaurants are nearby but you also have everything you need should you want to cook a nice meal for yourself "at home". Beautiful accommodation located within a short walk to attractions, restaurants and transportation. This unit was delightful and I would highly recommend it. It had everything that we required from maps of the local area, books on Mexico City and restaurant suggestions. Arturo was a gracious host and helped us arrange transportations from and to the airport plus to attractions further afield. Internet as reliable. Arturo ~ (Owner), was a true gentleman in every aspect & a wealth of local knowledge. We spent a week and he accommodation was outstanding, the location - walking distance to everything in Zocalo is perfect. I would enthusiastically recommend this experience to anyone wanting to explore Mexico's history & charms. Famous wrestling theater called Arena Coliseo around the corner; The early murals by Diego Rivera in the Education Building on Plaza Santo Domingo; Santo Domingo Church built in 1629 and the Medicine Museum across the street. These are the real prices, please base your inquiry on them 1 bedroom ... $ 100/night .. $600/week .. $1800/month 2 bedrooms .. $140/night .. $800/week .. $2200/month 3 bedrooms .. $160/night .. $1000/week .. $4000/month Minimum 3 nights. On person or a couple pay less than a whole family of 5 or 6, of course, however you have rented the whole apartment. No multiple bookings, which means, you do not shear the apartment with anybody else.